Download Your Free Sustainability Guide! 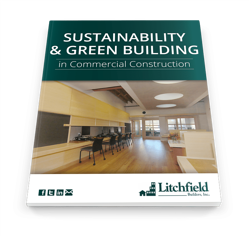 Download Your Free Commercial Sustainability Guide! Green building is not just a passing trend. Commercial construction projects, large or small, have long term environmental, economic, and social consequences. In Connecticut and the country in general, the incorporation of sustainable practices is a hot topic. Download your free copy today and get your next commercial construction project started on the right foot!